In case you haven’t heard, Odell Beckham, Jr. is requesting a massive raise in his next contract. The fourth-year wide receiver will be making just over $3 million this season and $8.46 million in 2018. Based on his production over his first three NFL seasons, he would be more than deserving of becoming one of the highest-paid wide receivers in the NFL. That’s not all he wants in his next deal, though. In fact, not only does the Giants standout want to be the highest-paid wide receiver in the league but he also wants to be the highest-paid player in the NFL. For next season, the highest-paid player in football will be Raiders quarterback Derek Carr, who will be making exactly $25 million. A more realistic bar for Beckham to clear would be that of Antonio Brown, who is currently the NFL’s highest-paid wide receiver and will earn nearly $20 million in 2017. And while such an investment may be a taxing endeavor for the Giants, Beckham could be that rare player who is actually worth the astronomical sum of money he’s about to receive. That’s right: Beckham is the only player in the entire league to amass that many receiving yards and touchdowns in every year since he came into the league. Keep in mind that he missed the first four games of the Giants’ 2014 season before averaging a truly bonkers 108.8 receiving yards per game for the rest of that year to finish with 1305 yards. Beckham also pulled off that 1300-yard feat in the next two seasons. Only one other player (Antonio Brown) has done this twice, and only eight other players were able to do it just once. Additionally, Brown tied with Beckham for the most touchdowns (35) of any pass catcher in the league during this period. Beckham may not have been the most statistically eye-popping wide receiver over his first three seasons (even if he was the most visually impressive) but, in some ways, he’s been the most consistently productive. QBR is shorthand for Total Quarterback Rating and was created by ESPN in 2011 to measure a quarterback’s performance. 50 is considered average. Roethlisberger has missed six games over the past two seasons. Matt Ryan is the defending NFL MVP and Ben Roethlisberger has won two-thirds of his starts in his NFL career. In case you haven’t figured it out, Beckham has been saddled with Eli Manning, the worst quarterback out of the three, for the vast majority of his young NFL career. Last season, in the category of QBR, Manning ranked 27th among qualified quarterbacks; this put him behind accomplished players such as Trevor Siemian, Brock Osweiler, and Carson Wentz. Among all qualified signal-callers, Manning’s 2016 QBR was higher than those of just three quarterbacks: Blake Bortles, Ryan Fitzpatrick, and Case Keenum. You probably didn’t think about it this way, but Manning was one of the worst quarterbacks in the NFL last year. That’s absurd. Just imagine if Beckham had an even more talented passer to complement his ridiculous receiving abilities. Even with Manning at the helm, Beckham had the third-most catches in football last season despite having the lowest catch percentage of any of the top five players in receptions. Not to disrespect Manning, but on many occasions, Beckham has been insanely good in spite of his quarterback. And as for that massive contract he has been angling for? If I were in the Giants’ position, I’d just give it to him. While giving one player north of $25 million per year will handicap the front office’s ability to fill the rest of the roster under a $167 million salary cap, the ability to lock up a potentially generational talent should not be met with apathy. In fact, I’d go as far to give Beckham a metaphorical blank check and let him and his representatives decide how much he wants to make. He’s really been that good and, in some respects, he has been the best wide receiver in football over the past three years. Fortunately, the Giants seem to understand Beckham’s worth. Yesterday, Giants co-owner John Mara said that the team will extend Beckham’s contract and made it seem like a matter of when, instead of if, a deal will get done. The Giants are one of the best-run organizations in professional football and it doesn’t look like they’re going to let their best player slip away because of a contract dispute. 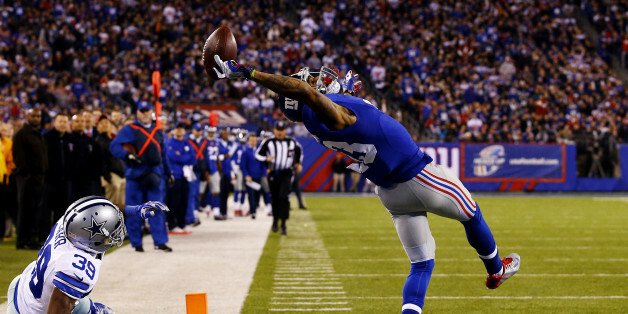 Odell Beckham, Jr. wants to be paid like the best player in the NFL. While he may not necessarily be that, he deserves to get all the money he possibly can. His performance has clearly demonstrated that he’s earned the right to an enormous payday.